Boulevard's Visitors Center has exhibits and an expanded gift store. Nearly 20 breweries are scattered across Kansas City and the surrounding area – far too many to visit in a weekend unless you’re really ambitious and have a reliable Uber driver. So we pared down this list to seven must-visit breweries, places where craft beer fans can savor a pint (or three) at a comfortable pace that doesn’t require the precision of a Swiss-made watch. Established in 1989, Kansas City’s hometown brewery is well-known throughout the Midwest for its flagship Pale Ale, Boulevard Wheat, and Smokestack Series. In recent years, demand for tours exceeded the brewery’s capacity. In 2015, Boulevard hosted nearly 60,000 visitors on 2,300 tours in its production brewery; thousands more had to be turned away. This summer Boulevard opened the expansive Visitors Center in its Tours and Recreation building one block from the brewery. 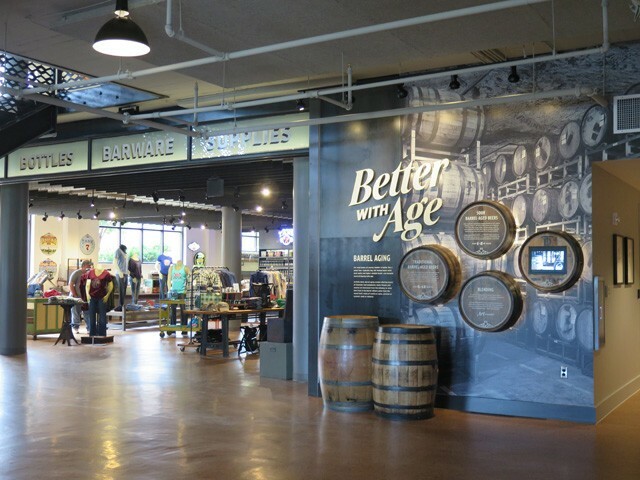 Open seven days a week, the Center displays exhibits about Boulevard and brewing history, schedules free daily tours, and houses a tasting room, expanded gift shop, and 300-seat Beer Hall. Not only a fun place to hang and sample beers, the hall also serves food such as a chicken andouille sandwich with beer cheese sauce and cheddarwurst. Sixty-minute public tours include two complimentary beer samples at the end of the walking portion. No reservation needed for tours. Must-try beers: The tasting room has a rotating selection of 24 beers on tap including its flagships, Smokestack Series, test batch beers, and seasonal offerings. There’s something for everyone to explore like the popular Cranberry Orange Radler released in fall 2016. One of the city’s newest breweries sprang up in the former space of the Golden Ox, a historic steakhouse founded in 1949 in the West Bottoms’ Stockyards District. Owners Greg Bland, Ray Kerzner and Brendan Gargano hired Micah Weichert (75th Street Brewery, Gordon Biersch) to lead brewing operations. The space preserves many western-themed elements of the restaurant’s stockyards heyday including stained glass murals, brass fixtures, circular leather-lined booths, and photos of a bygone era. A glass-lined wall offers a view of the 15-barrel, three-vessel system. Limited snacks and a cheese board are available. Nearby Amigoni Urban Winery, restaurants Genessee Royale and Voltaire and dive bar Lucky Boys offer additional sustenance. Must-try beers: Stockyards’ core beers include Golden Alt, Black IPA, American-style Brunch Stout, Thunder Hef, a hefeweizen, and hoppy India Pale Lager on tap plus beer from local breweries. The Belgian yeast in the Saison presents notes of orange peel, lemon peel, and crushed black pepper. For fans of maltiness, try the Fox Trotter Scottish Ale made with three different Crystal malts. The tap room at the Cinder Block is a great place to enjoy a beer — and a game of Jenga. Master brewer Bryan “Bucky” Buckingham (Free State Brewing, 75th Street Brewery, Power Plant Brewery) brought a wealth of industry experience to Cinder Block Brewery, founded in 2013 by homebrewer Bryce Schaffter. The well-rounded lineup of core beers are solid representations of style with consistent quality. 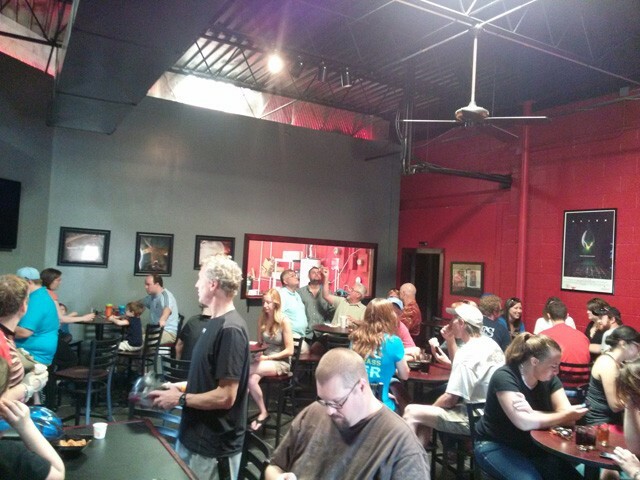 The large tap room is a convivial space to watch sports on widescreen TVs, socialize, play giant Jenga on the patio, and compete in Geeks Who Drink trivia on Tuesday evenings. While no food is available, customers can bring food on premise to enjoy with a beer. Based in North Kansas City, the brewery is a five-minute hop across the Missouri River from downtown Kansas City. Cinder Block is also mere blocks away from The Big Rip Brewing Company (216 East Ninth Avenue, North Kansas City, bigripbrewing.com) and Calibration Brewing Company (119 Armour Road, North Kansas City, calibrationbrewery.com). Visit all three breweries for a mini-tour. Must-try beers: Hopheads will enjoy Block IPA made with six hop varieties to yield citrus and passionfruit aromas and piney notes. Northtown Native, a light refreshing California Common, is a perfect session beer. If available, try the Black Squirrel Russian Imperial Stout, aged thirteen months in a whiskey barrel, the summer seasonal KC Weiss, or winter seasonal Cinder Noel, a Belgian strong ale. The brewery also makes excellent French apple cider and English cherry cider. The Big Rip tap room pays tribute to its brewers' love of horror and sci fi. This taproom and brewery takes its name from a scientific theory proposing that the universe is expanding. Ultimately, the expansion will defy gravity, disband galaxies and solar systems, and the universe will end. All the more reason to drink locally brewed beer before the theory is no longer hypothetical. The Big Rip’s owners-brewers Kipp Feldt and Josh Collins specialize in beers that are malt-forward, gluten-free fruit beers, and other diverse offerings. The brewers’ love of horror and science fiction is reflected in the taproom decor and sly references in the beer names to characters in popular film and television shows. Televisions stream genre movies like Escape From New York. Explore the patio and play yard games when the weather is nice. The brewery is viewable through windows but tours are typically not offered. Must-try beers: Whether you are gluten-free or not, fruit-based beers such as raspberry and blueberry are refreshing sippers. Aisle 12 West Coast IPA, Hefe the Killer hefeweizen, and Hathor's Sweet Brown Ale are popular. For more adventurous tastes, try Zelda's Vanilla Cream, Outlander Roggenbier Rye Ale, seasonal Chai Milk Stout, or the Scotchlander Wee Heavy aged in Pinot Noir wine barrels, due out in late 2016. This production brewery built early buzz among craft beer fans and judges on the local beer festival circuit long before it opened in September 2015. Named after co-founder and innovative home brewer Michael Crane, the brewery specializes in farmhouse ales, lambics, and Berliner Weiss. The brewery and taproom is a short drive from downtown Kansas City to the suburb of Raytown, but a taproom visit is well worthwhile. Check the website for taproom hours. The current taproom is a modest space with plans to upgrade and expand by 2017. Several Crane beer rotate on the taps. Tours, offered based on staff availability and demand, show off the brewery production space, grain milling, barrel room, and other features. Seven hundred fifty-ml. bottles are available for sale. Must-try beers: Year-round beers include the toasty malt and fruity yeast of aromatic Belgian-inspired Saison and Farmhouse IPA, seasonals such as Orange Gose and Grapefruit Gose, and tart Weiss options – apricot, kumquat, tea and beet. The latter has a dazzling ruby hue and subtle earthy zing to offset the sourness. 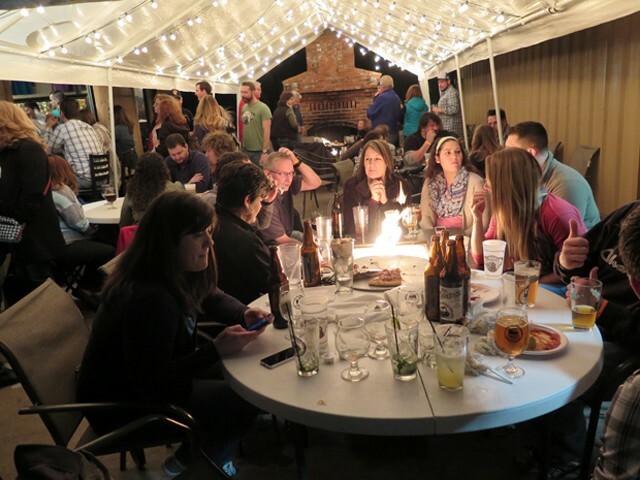 Enjoy a beer (or a pizza) on the Martin City patio. This south Kansas City-based brewery has grown into a dynamic operation since launching in 2011. 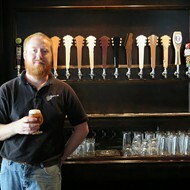 MCBC opened a craft beer-based pub first with a selection of top regional and national beers. In February 2014, owners Matt Moore and Chancie Adams built the brewery, taproom and pizza restaurant with a wood-fired oven next door to the pub. The restaurant is a popular spot to grab a few beers, nosh on some of the city’s best pizza, and hang out indoors or on the patio. For a change of pace, stroll over to the pub for upscale eats. Master brewer Nick Vaughn creates bold beers with a twist and classic styles with complex layers of flavor from barrel-aging and use of adjunct ingredients and yeasts strains. The taproom pours a variety of beer not available in MCBC cans in the retail market. Growlers, crowlers, and limited 750-ml. bottles are available to take home favorite suds. Must-try beers: Abbey Belgian Ale (there’s also a barrel-aged version), Big Brother Imperial Stout aged in Scotch barrels, bold and hoppy Hard Way IPA, City Saison, Poitier Brandy barrel-aged Tripel, and Belgian Blond. Ask about seasonal and limited-run beers on tap. This German-inspired production brewery and beer hall in the Waldo suburb specializes in classic German styles brewed with artisan craftsmanship. Hop and malts are sourced direct from Germany for authentic flavor and representation of styles that include pils, hefeweizen, dunkel, helles, and doppelbock. 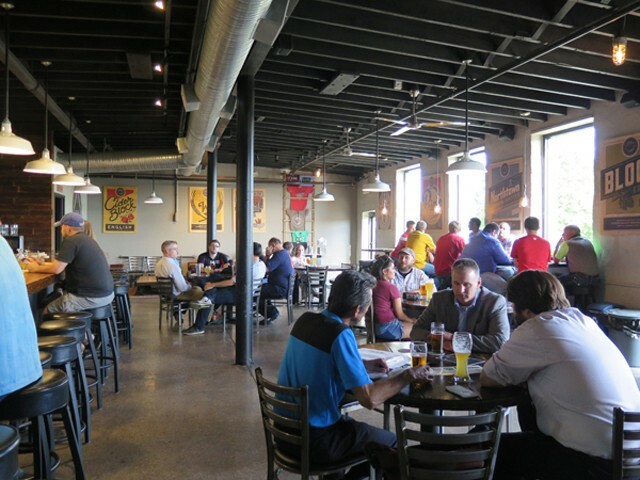 The taproom has communal-style seating at picnic tables with a German beer hall atmosphere. College and pro sports and German football games play on televisions. Traditional German musicians perform on weekends. The kitchen serves charcuterie plates, weisswurst, pretzels, brats, and dried sausages. Take advantage of the deck and outdoor biergarten if the weather is amenable. Must-try beers: Best-selling Dunkel is a dark brown Munich lager with prominent malt. Weizenbock, a strong German-style wheat, crisp Pils, spot-on Hefeweizen, and Der Bauer, a German interpretation of a farmhouse ale, are crowd-pleasers. Prost! Kansas City-based food and beverage writer Pete Dulin is the author of Kansas City Beer, to be released from American Palate on October 24. Pre-order a copy now via Arcadia Press or Amazon. His other books include KC Ale Trail and Last Bite: 100 Simple Recipes from Kansas City’s Best Chefs and Cooks. Kansas City Beer explores the history of brewing in Kansas City from the 1850s to present.